There are a variety of ways that you can get involves and become a part of our circus family. How would you like to be be involved? These are some of our suggestions, but we're open to yours as well. We love fresh ideas! Although we are not a non-profit, we have philanthropic ideals and wish to create a circus community that inspires artistry and self-confidence in people of all ages and abilities. Volunteers are always appreciated! As we build our tribe, we hope to develop a team of volunteers to help us create and provide outreach programs. We welcome corporations, arts organizations, community leaders, families and individuals. We're hoping to build a team of volunteers to do more than just donate their time and resources – we're hoping to form roots in the Boerne community in order to fuel future growth. Be a part of something magical by sharing your talent and heart. Whether you are interested in assisting with developing our outreach program, supporting our staff, or helping with student shows, etc. you can make a real difference in our community by donating your time, experience, and skills. Each semester we will take on one intern. Interns get unlimited classes and training as well as opportunities to participate in student shows in exchange for work trade: marketing, social media, office and class assistance and help with community events. This is a great opportunity for students to earn credit for school while learning to fly. We will work with you to make sure your school requirements are met. Email boernetrapeze@gmail.com if you are interested in applying for the Fall 2018 semester. Applications will be due June 1st, a decision will be made by June 15th. 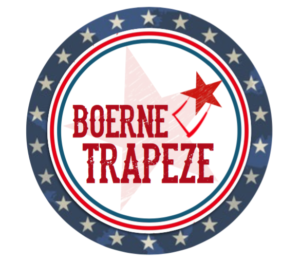 Join our team at Boerne Trapeze as a Work-Trade volunteer and you'll enjoy classes in exchange for your time and hard work! Opportunities exist for class and childcare assistance, as well as advertising for events. Additionally, if you have specialty skills/services, we are also open to that. Contact us for more info.